The Qwerkywriter Bluetooth Keyboard | OhGizmo! By Gadget Flow on 03/09/16 • Leave a comment! 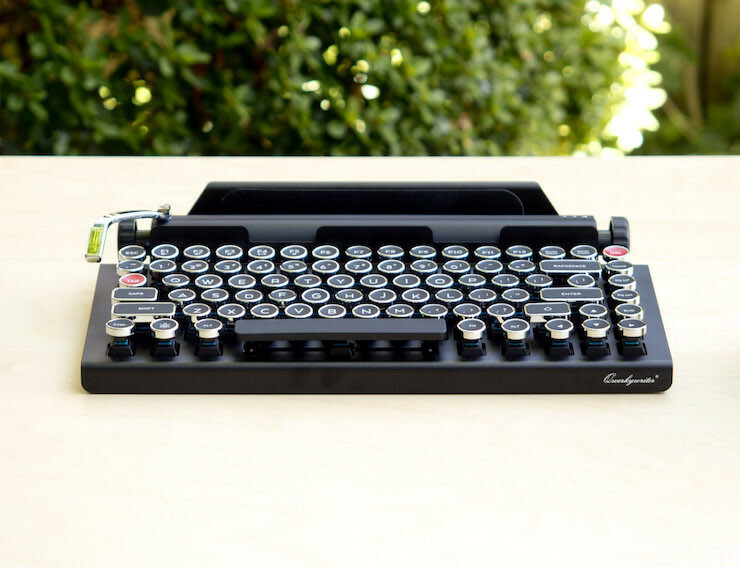 Channel your inner late 19th century writer with the Qwerkywriter Bluetooth Keyboard. This extremely detailed keyboard connects wirelessly to your devices and has been inspired by the original typewriters. Made of aluminum, the Qwerkywriter perfectly melds the traditional world of the first typists with the technology world. The keycaps have a vintage look and feel to them and even sound like a traditional typewriter when pressed. A built in tablet stand can hold your devices up to 5/8” thick. Available in both US and UK QWERTY layouts, the Qwerkywriter has all of the function, number, and symbol keys of a typical keyboard. Weighing under 3 pounds, this keyboard can be taken with you anywhere. It’s conveniently rechargeable via USB and a full battery will last three months.